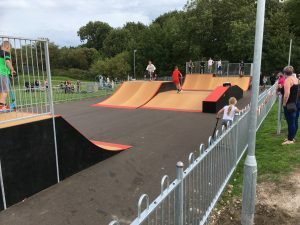 Hundreds turned out for the opening of the new skate park at Station Field, Aylesham, on Saturday. The £140,000 facility has been well used over the weekend by local children eager to try it out. There is plenty to enjoy with a rope climbing frame, zip wire and the large wooden ramps being the main feature. 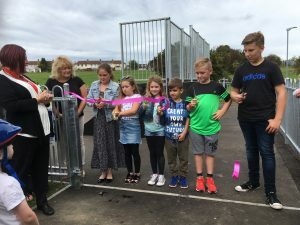 Several youngsters who had helped with consultation and planning of the skate park cut a ribbon between them to declare it officially open and were supported by Aylesham Parish Council Chairman Jo Cartledge and Dover District Council’s Deputy Chairman David Hannant. 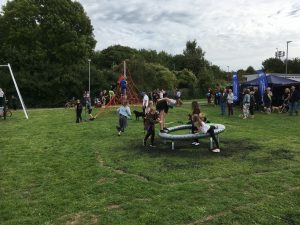 Displays of skate boarding and BMX biking were given by the Far Academy Trust along with competitions and prizes for young people to take part in as well. 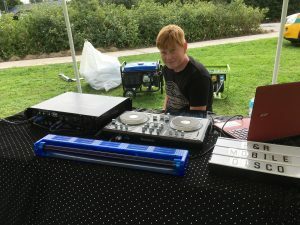 Music was provided by local DJ Finley Sleith (who also contributed ideas towards the design of the skate ramp with the manufacturer Fearless Ramps), food was donated by Aylesham Butchers and Aylesham Parish Council, and was served by Woody’s Hog Roasts. Some of the cost of the occasion was covered by a donation from Kohls (KCS) Surveyors. 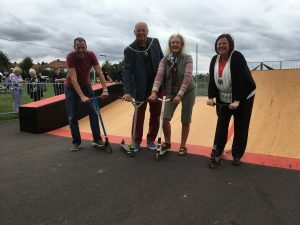 Costing a total of just over £140,000, the skate park has been taking shape during the past couple of months and represents the single largest ever investment by Aylesham Parish Council which contributed £60,000 towards it. Park builder Karllee Construction kindly donated the basketball stand and hoop, £2,000 was donated by local company Ovenden’s and the rest has come from Section 106 scheme funding through the Aylesham Garden Village development.